Landings of scup peaked in the 1950’s at over 20,000mt and deceased to about 5,000mt by the late 1960’s. Quotas have been implemented since 1996 but the fishery was declared overfished in 2005. A rebuilding plan was set and abundance has since increased. In 2014, 7,228mt were landed. 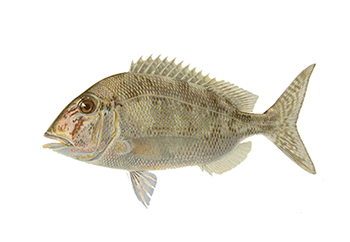 Scup are managed together with summer flounder and black sea bass by the Mid-Atlantic Fisheries Management Council (MAFMC) and the Atlantic States marine Fisheries Commission (ASFMC). Management has been effective at rebuilding the population from an overfished state. Current regulations include bag limits, size restrictions, gear restrictions, and permit requirements. The scup population is currently healthy. In 2005, the stock was overfished but has since recovered and is sustainable. Scups have life history characteristics that make them moderately vulnerable to fishing pressure. Bottom trawls have the potential to cause habitat damage as they make contact and drag across the ocean floor. It is unknown how long benthic communities and biogenic habitats need to recover from bottom trawling. Area closures can protect the most sensitive habitats from bottom trawls. An ecosystem-based management approach is being developed in order to account for the scup fishery’s impact on food web dynamics. Bottom trawls are a nonspecific gear type, which catches a variety of bycatch. Of most concern are skates which have a high vulnerability to fishing pressure, and summer flounder. Bottom trawls have the potential to cause habitat damage as they make contact and drag across the ocean floor. It is unknown how long benthic communities and biogenic habitats need to recover from bottom trawling. Area closures can protect the most sensitive habitats from bottom trawls, although the area closures cover a limited amount of habitat. An ecosystem-based management approach is being developed in order to account for the scup fishery’s impact on food web dynamics. Bottom trawls are a nonspecific gear type, which catches a variety of bycatch. Of most concern are the overfished summer flounder and winter skate.